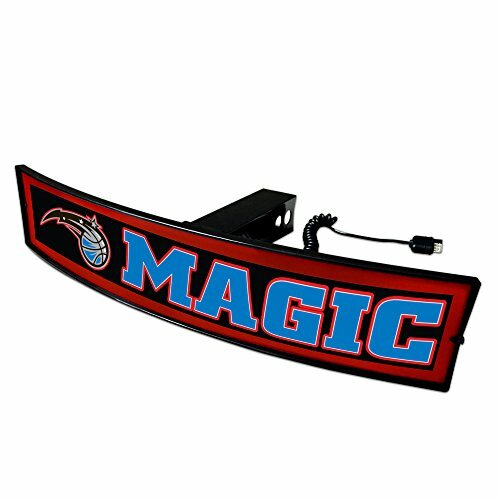 CC Sports Decor NBA - Orlando Magic Light Up Hitch Cover - 21"x9.5"
Let all our motorist know what your favorite team is with the Light Up Hitch Cover. With true team color logos and wordmarks being illuminated with LED lights, no one will miss who you support. The LED lights work in conjunction with both turn signals, running, and break light, meaning the Light Up Hitch Cover enhances your vehivals saftey by actin as an extra break light. Housed in a durable HDPE plastic, the Light Up Hitch Cover is safe to be used in all weather condidtions. If you have any questions about this product by CC Sports Decor, contact us by completing and submitting the form below. If you are looking for a specif part number, please include it with your message. CC Sports Decor NBA - Dallas Mavericks Light Up Hitch Cover - 21"x9.5"
CC Sports Decor NBA - Brooklyn Nets Light Up Hitch Cover - 21"x9.5"
CC Sports Decor NBA - Golden State Warriors Light Up Hitch Cover - 21"x9.5"
CC Sports Decor NBA - Minnesota Timberwolves Light Up Hitch Cover - 21"x9.5"
CC Sports Decor NBA - Philadelphia 76ers Light Up Hitch Cover - 21"x9.5"
CC Sports Decor NBA - Milwaukee Bucks Light Up Hitch Cover - 21"x9.5"
CC Sports Decor NBA - New York Knicks Light Up Hitch Cover - 21"x9.5"
CC Sports Decor NBA - Toronto Raptors Light Up Hitch Cover - 21"x9.5"